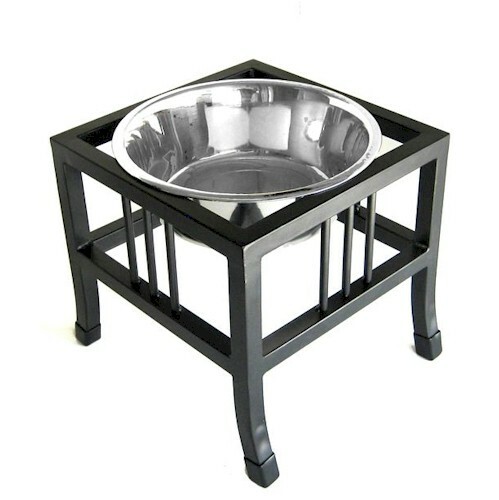 The popular single raised dog bowl is now available in a Triple Bowl Diner, the Triple Diner Mesh Elevated Dog Bowl Stand features a simple cross pattern, with non-skid plastic tips on feet of the raised dog dish feed stand. The triple dog bowl diner is perfect for pet owners with multiple dogs. The triple dog bowl diner rounded sides keeps food and water centered for ease of eating. The raised dog bowl stand features a unique mesh design that goes well with any decor. Sturdy wrought iron construction ensures that it lasts a lifetime. Available in Black.